CMI’s Credit & Collection Trivia Quiz - Credit Mediators Inc. This is a hard one but take a stab at it. How many countries have declared bankruptcy over the past 200 years? Answer: A total of 83 countries, including the world’s biggest economies such as the U.S., Germany, Japan, and U.K., have gone bankrupt in the last two centuries. When a country goes bankrupt, the most basic systems and institutions disappear. Power companies stop their operations, gas stations close, grocery stores run out of food, banks close their doors, and the government is unable to pay salaries to its civil servants. 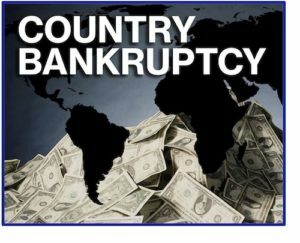 Today we still see a number of nations that have declared bankruptcy or are on the verge of doing so. Greece and Iceland have declared bankruptcy as recently as within the past ten years and Venezuela is on the verge. Although not commonly known, the U.S. has declared bankruptcy five times since its foundation. Once it could not pay its foreign debts and four times could it not pay its internal debts. These bankruptcies had resulted from financial crises in the banking sector, the first of which was in 1790 and the last of which was in 1933. Germany went bankrupt eight times in the last 215 years. Currently the world’s fourth and the EU’s biggest economy, Germany had last gone bankrupt in 1948 due to the second World War. The world’s fifth biggest economy, the U.K., went bankrupt four times, the last of which was in 1932.